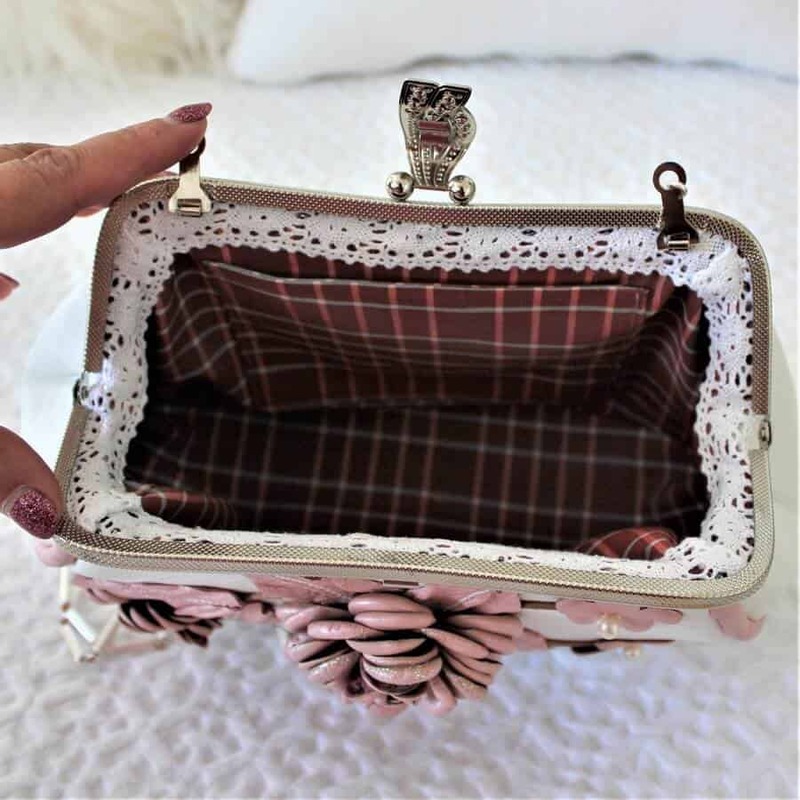 I decided to publish this tutorial on how you can make the purse too because many of my friends showed interest. 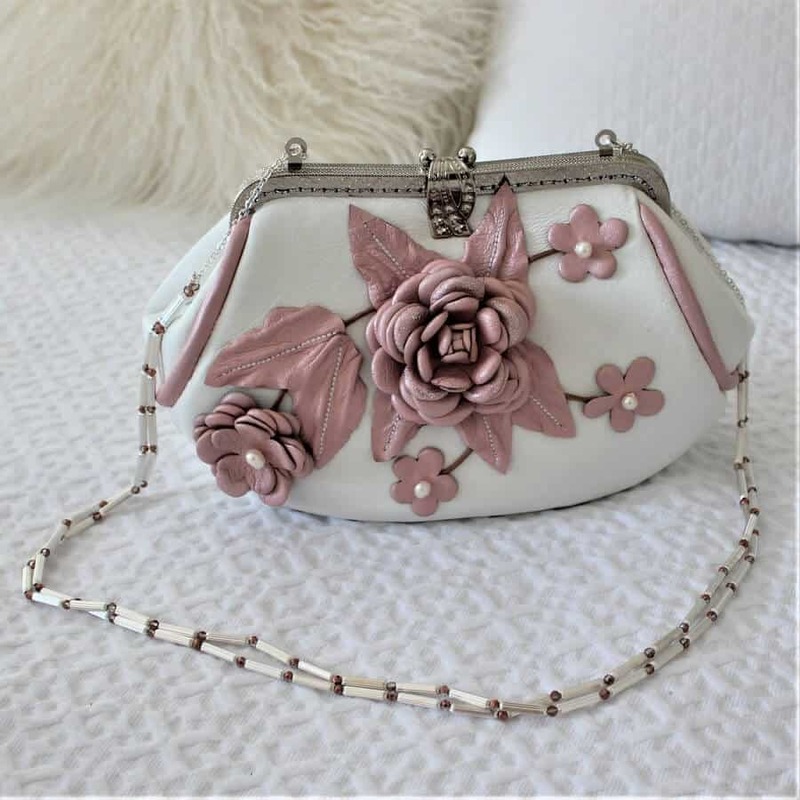 This charming purse is made from soft lambskin leather and is embellished with leather flowers, real pearls, it has nice shoulder straps and a classic metal frame closure. Inside it can easily fit a cell phone, a wallet, car keys, a compact mirror, and a lipstick. 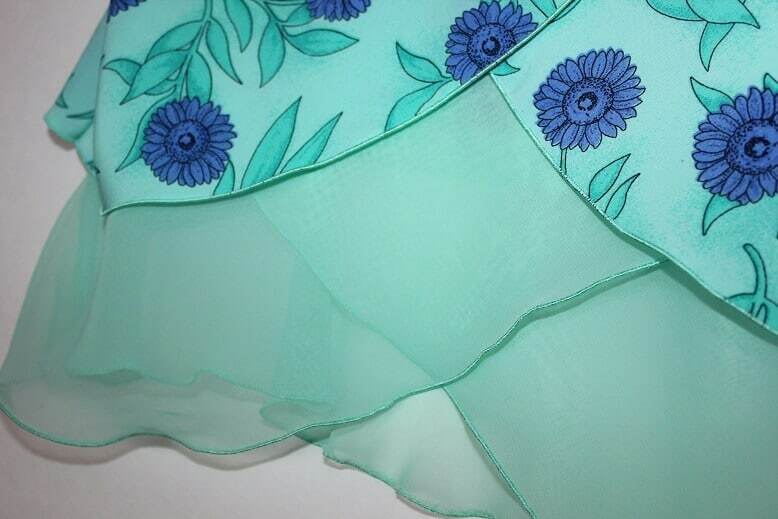 It’s perfect for a party, a wedding or any formal occasion. Also, it can be a pretty gift. 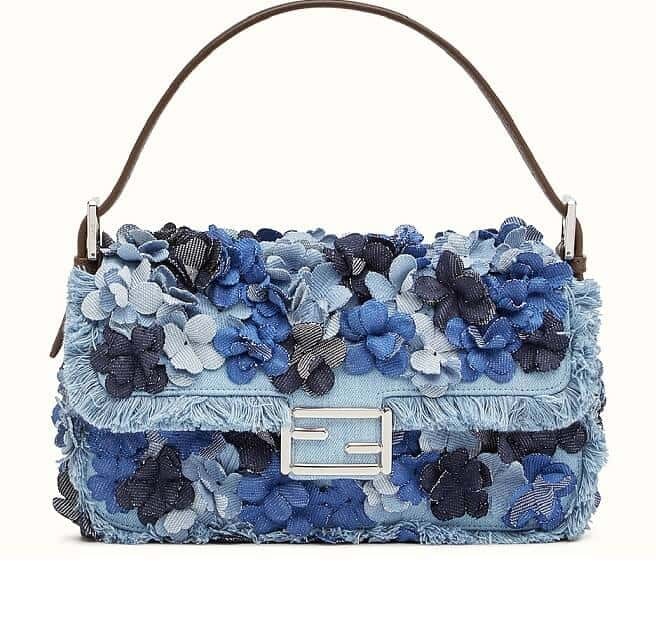 I was inspired to create the embellishments by these Chanel and Fendi purses. If you make the purse yourself it will not cost you an arm and a leg, right? 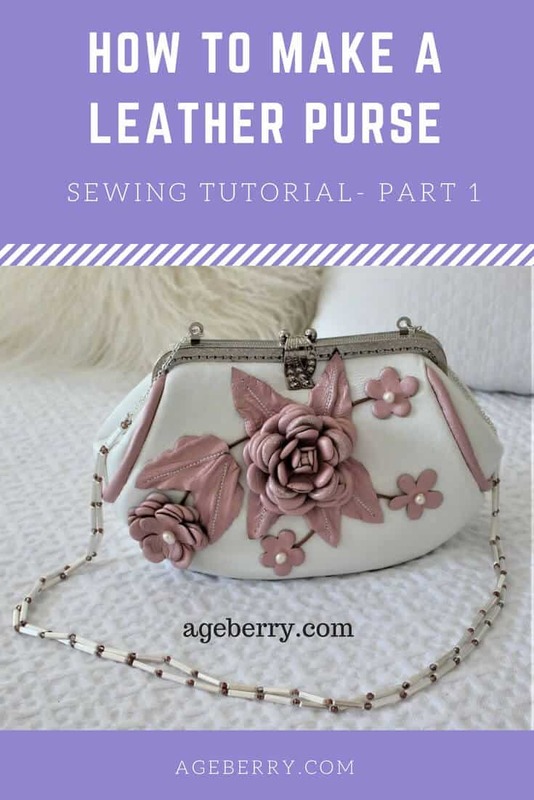 To start, I would like to share with you some thoughts about sewing with leather – a few important things for you to keep in mind while you work with it. Leather is a wonderful material to work with and it’s easier to handle (with proper tools) than you may think. For example, lambskin leather is quite soft and lightweight and it’s not thicker than denim, corduroy or upholstery fabric so your home sewing machine can sew it without any problem. Leather doesn’t fray and because of this you don’t need to finish edges – a serger is not required to sew leather! Leather is easy to cut and embellish! If cared for properly, leather will provide years of wear and your leather garments and accessories will look stylish for many years. All you need are a few special notions and tools and the courage to find a way around some challenges. I think the only way to build your confidence in working with leather is practicing. I like to sew with leather. 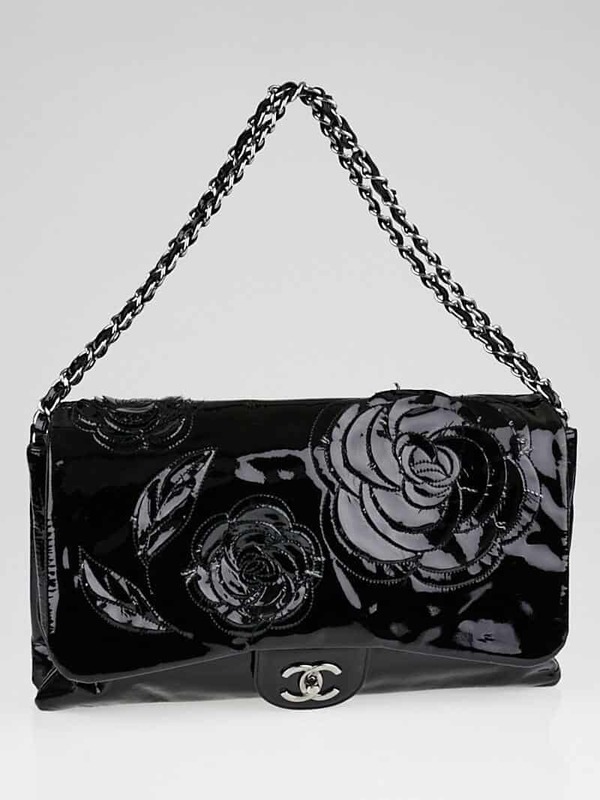 Leather garments and accessories are always in fashion but they are really expensive. If you make a skirt or a bag yourself it will be much cheaper. The only thing you need to invest in is those luxurious skins. Note: If you make a purchase through any of the links on this post I’ll earn a small commission at no extra cost to you. I only promote things I use and love myself and am always transparent about it! 1. Lambskin leather – also called nappa; it’s soft and thin leather and easy to work with. I used 2 different colors. There is an online shop on Amazon called Leather Treasure, you can buy nice skins from them here. 2. 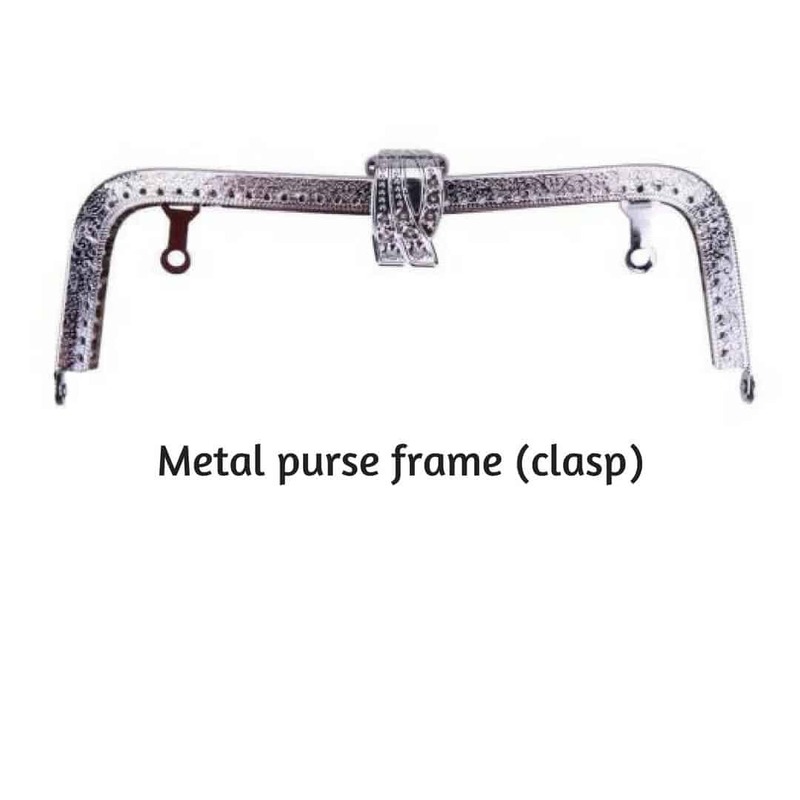 Metal clasp purse frame (size 20 cm or 8 in). I also found mine on Amazon – you can buy one here. 3. 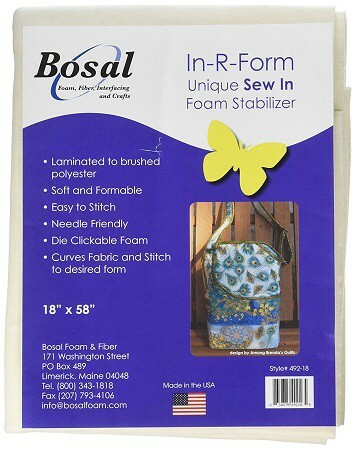 Bosal In-R-Form Unique Sew In Foam Stabilizer (not fusible) – Amazon has it also. 4. Small piece of fabric for a purse lining. 5. Sewing machine needles for leather sizes 90 and 100. You can buy them here. 8. Glue (I use this one: The ultimate! The only non-toxic, water-based super glue), you can find it here. So, here are the steps to make this purse. I started to make the bag with creating a pattern that’s suitable for the 20cm ( 8 in) metal frame I bought on Amazon. As you see in the images below this frame has many small holes and has to be stitched on to the purse. 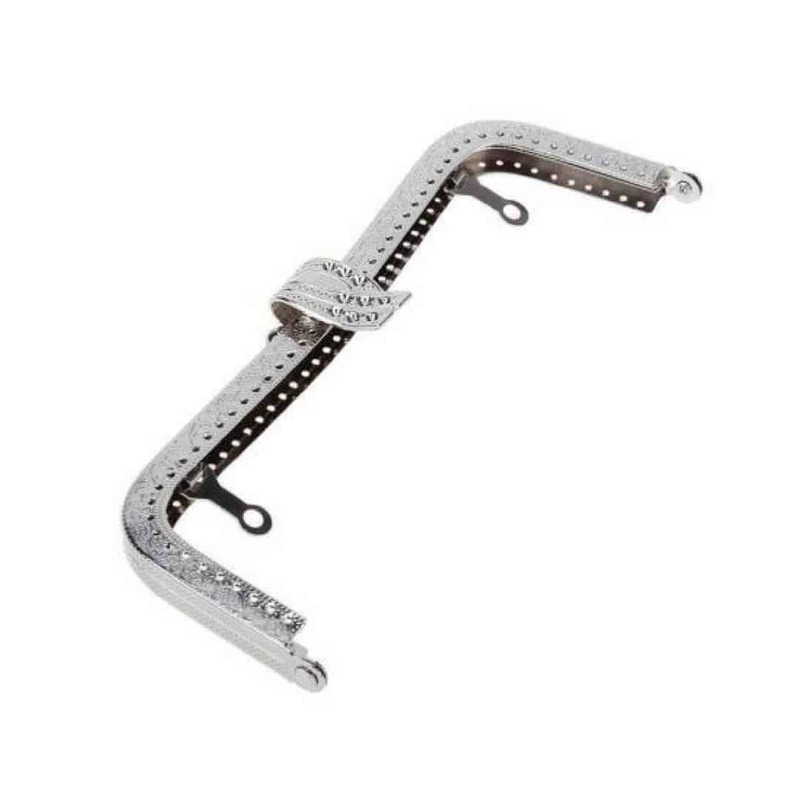 Have in mind that there are other types of metal frames and they can be attached to a bag differently (with a glue or with special pressure), I didn’t work with those frames so I can’t tell if they are better or worse than the one I used. These metal frames come in many sizes, shapes, and finishes. I had to make my own pattern so my purse will be the right size to fit the frame. If you buy the 20 cm (8 in) frame then you can skip this step and just download and print the leather purse patterns I made ( the PDF pattern has 1 cm (3/8 in) seam allowances). 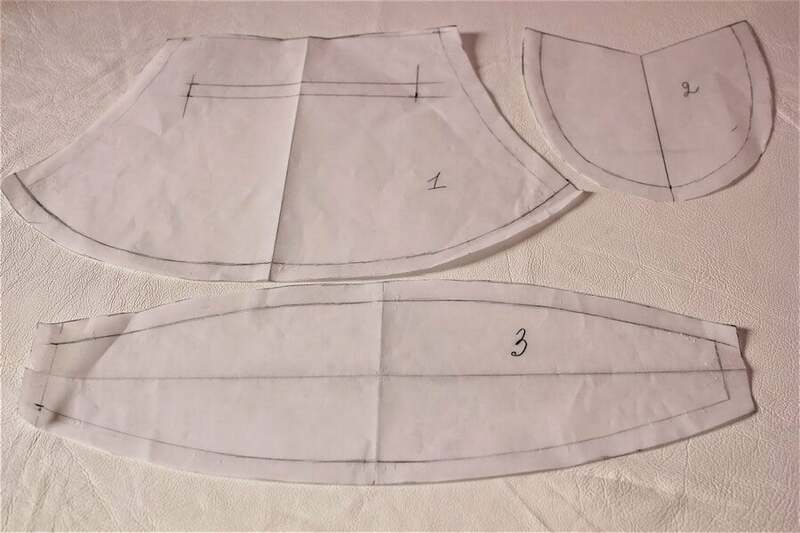 As the leather can’t be folded for cutting the pattern pieces and you will have to cut the pattern on a single layer – print 2 main panels and 2 side panels but only 1 bottom. But if your frame is a different size than 20 cm then you can make your own pattern or adjust the one I made. 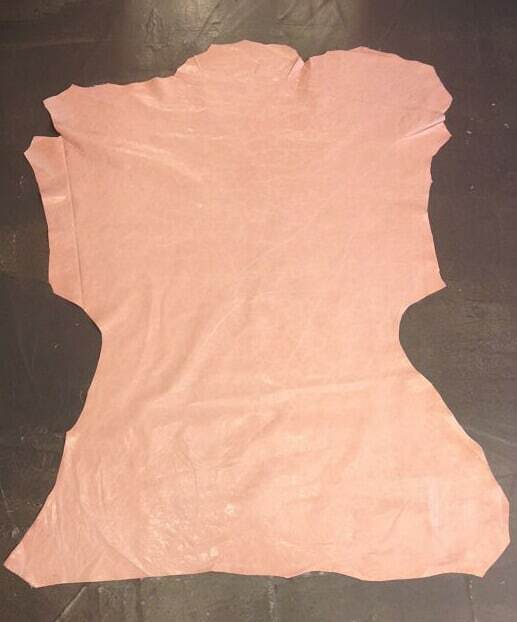 Make it from denim or upholstery fabric so you know how it looks like before you cut your leather. The purse actually has only 4 seams to stitch, so it will not take a lot of time to make the mock-up. 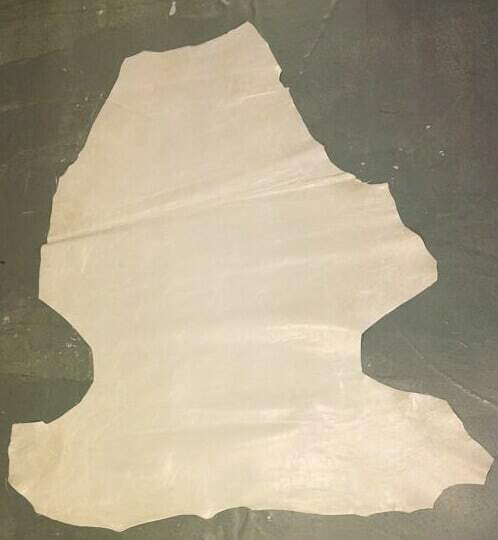 To prepare the leather for cutting place it flat on a table and work on a single thickness. Check the skin for imperfections before cutting. I use sharp shears to cut leather pieces but you can cut with a rotary cutter (as they usually recommend for leather). You can’t use pins to attach pattern pieces to the leather because they will leave holes in the skin. Use pattern weights or clear tape, in this case, to hold the pattern in place. I collected for many years real stone creations, so I use them as pattern weights. Use a pen to transfer pattern markings on the back of the leather. Cut also two rectangular pieces of different color leather for piping – 30 cm x 4 cm (11 ¾ x 1 9/16 in). 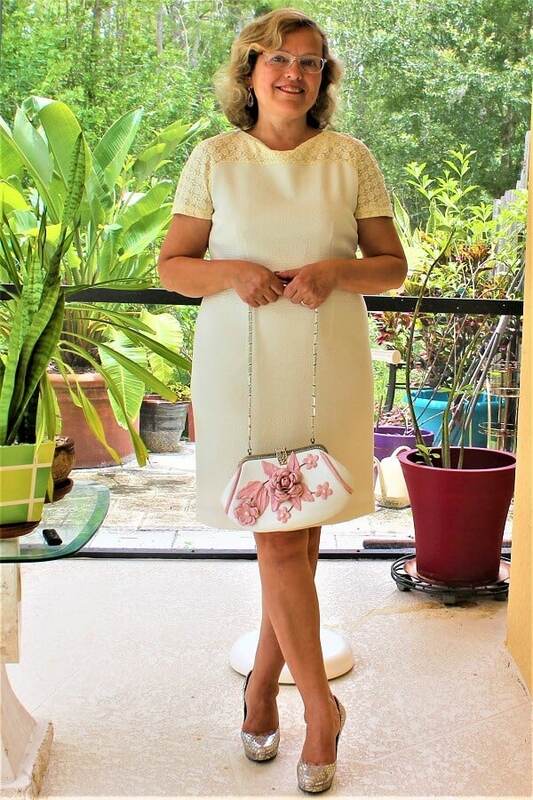 If you have a modern computerized cutting machine like Brother Scan&Cut you can scan pattern pieces of the purse and cut leather with the machine – this cutting will be just perfect. I am truly amazed by what this cutting machine can do. This is the description of the machine I took from Amazon: “Developed with the advanced, cutting-edge technology that Brother is known for, ScanNCut2 is truly an incredible innovation in electronic cutting machines. This standalone cutting machine gives artists the freedom to make truly unique, one-of-a-kind creations with the push of a button. 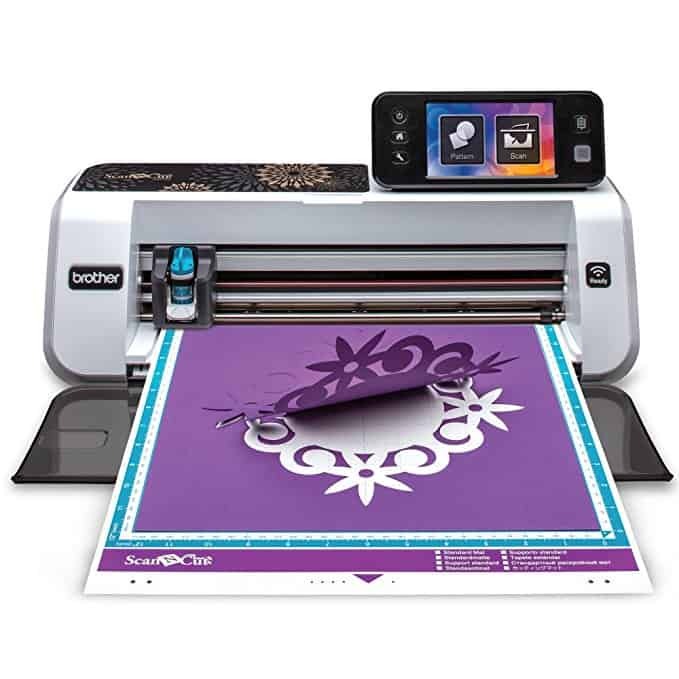 The Brother CM350 ScanNCut2 provides users with the flexibility of connecting wirelessly or directly to a PC and scanning images directly to the system, and it features a large cutting area to cut and draw a variety of shapes and designs with precision. 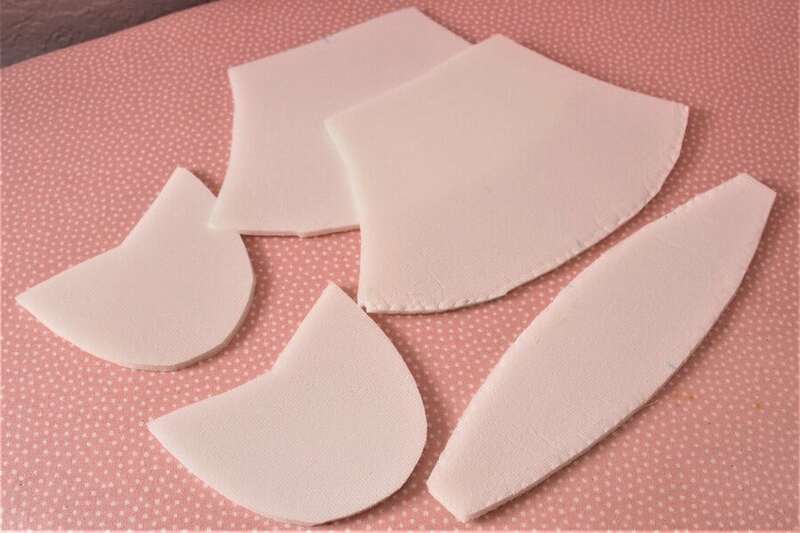 But here you have to be very careful – the foam stabilizer pieces have to be 1.5 cm (⅝ in) smaller than the main purse pattern pieces; I cut stabilizer pieces WITHOUT any seam allowances, and the lining has to be 1 cm (⅜ in) smaller than the main pattern (WITH seam allowances). 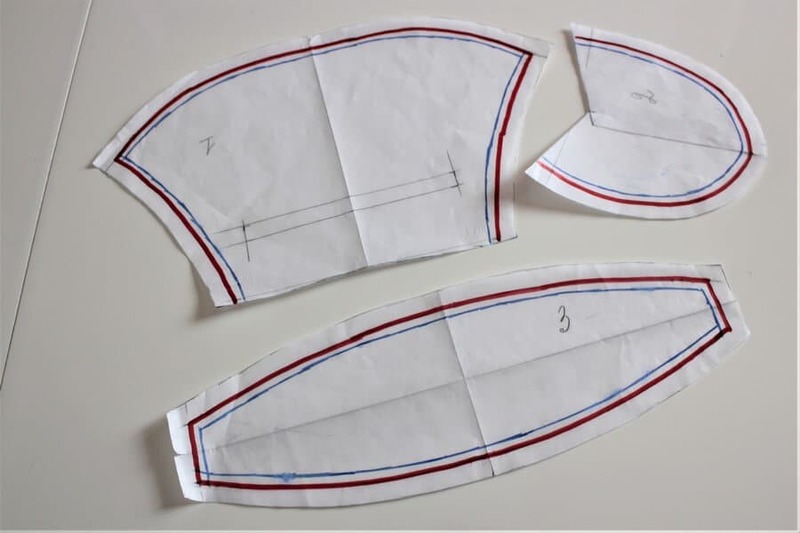 Also cut 2 pieces of lining fabric for a pocket – 15 x 12 cm (6 x 4 ¾ in) including seam allowances. In the images below blue line is for the stabilizer – 1.5 cm ( 5/8 in) smaller than the main purse pattern, and the red line is for the lining – 1 cm (3/8 in) smaller than the main pattern. This is the foam stabilizer I used for the purse – Bosal In-R-Form Unique Sew In Foam Stabilizer. 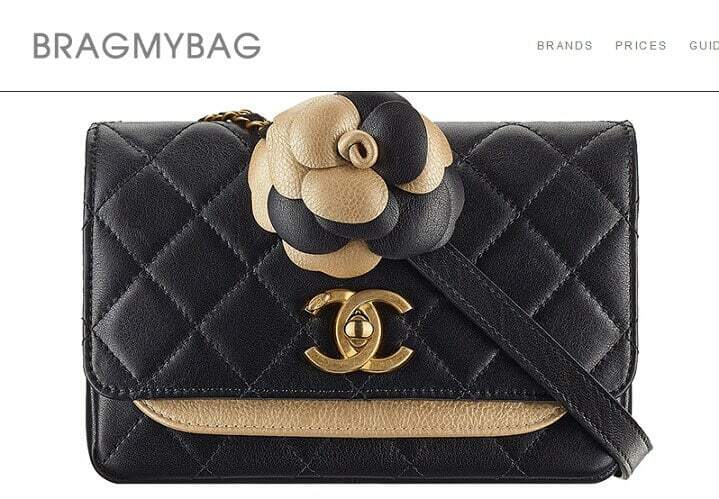 This foam stabilizer is necessary for the purse to keep the proper shape, the leather is soft. 5. Stitch the leather panels of the purse to the purse bottom. Set up your sewing machine for stitching leather. Teflon foot is really good for sewing leather on a regular sewing machine. It has a special coating that enables leather to pass smoothly under the foot. I use Janome Memory Craft 6600P and it comes with AcuFeed system which is practically a built-in walking foot. You can use other types of walking feet working with different sewing machines. A regular sewing machine foot for straight stitching may work also if you have only 2 layers of lambskin leather. Use a new needle for the project. There are special leather needles different sizes for different thicknesses of leather. For my lambskin leather I used a special leather needle Schmetz sizes 90/14 and 100/16. These needles leave only a tiny hole in the leather. But for lambskin, you can probably use Universal or Microtex needles as well (but it didn’t work for me though). Let me give you some small tip about sewing machine needles. We usually use many types and sizes of needles for our sewing projects. For example, for this purse, I used leather needles of two sizes. So, what do you do with those needles after the project is done? 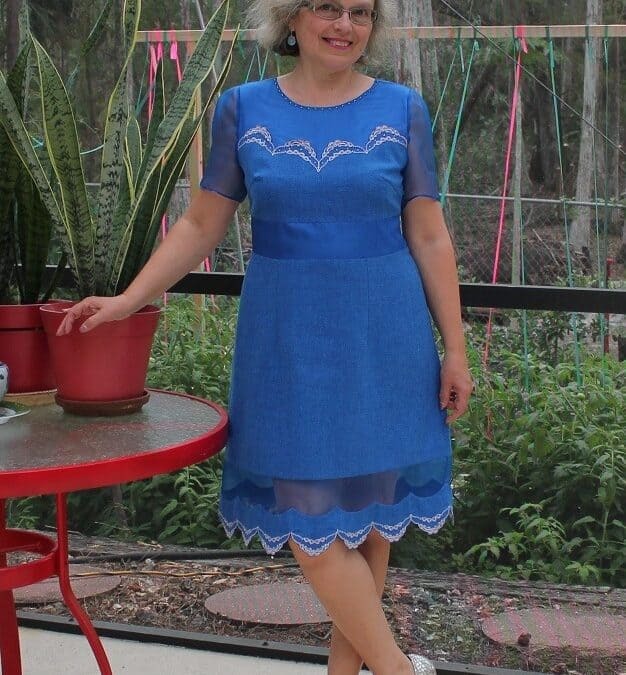 I don’t want to throw them away, because I did only a few stitches with them – 2 seams with size 90 and 2 seams with size 100. The needles are still good and I will want to use them for other projects as well. But how to keep them and know exactly what is the needle and what is its size? If there are marks on the needles then it’s easy, like with these leather needles size 90. But Schmetz leather needles size 100 don’t have any marks. So I mark them myself with a permanent marker and after that, I know exactly what needle I use (see the video below). 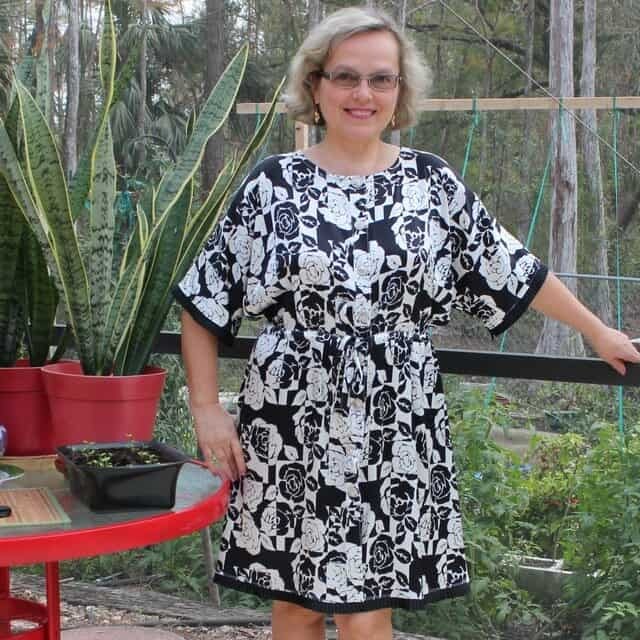 Threads – use strong polyester threads 40 weight. Cotton threads are no good, they break. It’s very important for the thread to match the thickness of the needle eye – if they don’t match the hole made by needle will be too big for the thread. In other words, use the thinnest needle that can accommodate the thread to avoid leaving large holes in the leather. Put stitch length to 2.8-3 mm, for stitching leather it has to be slightly longer. Loosen the thread tension – I usually put it to 1 (instead of 3-4 for regular fabric). Practice stitching on scrap pieces before working on your purse and adjust the machine tension and the foot pressure. It’s good to test how your sewing machine handles the leather. If you see that the sewing machine skips stitches try to change the needle for a bigger size. You can’t use pins because they will leave holes in the leather. So connect pieces together before stitching with office supply clips, paper clips, clothespins or these special clips (they are called Wonder clips) instead of pins (to hold pieces together). Don’t backstitch – just tie the thread tails because backstitching puts more holes in the leather. We don’t usually use an iron for leather. But you need to open seams somehow without an iron. For this we use glue. The best adhesive which everybody recommends is leathercraft cement. But there are plenty of other kinds we can use. I use this one: The ultimate! The only non-toxic, water-based super glue. It has no odor, dries clear and adheres to everything. But I dilute the glue with water in a small container – half and half approximately because it gives me time to work with it before it sets. 6. 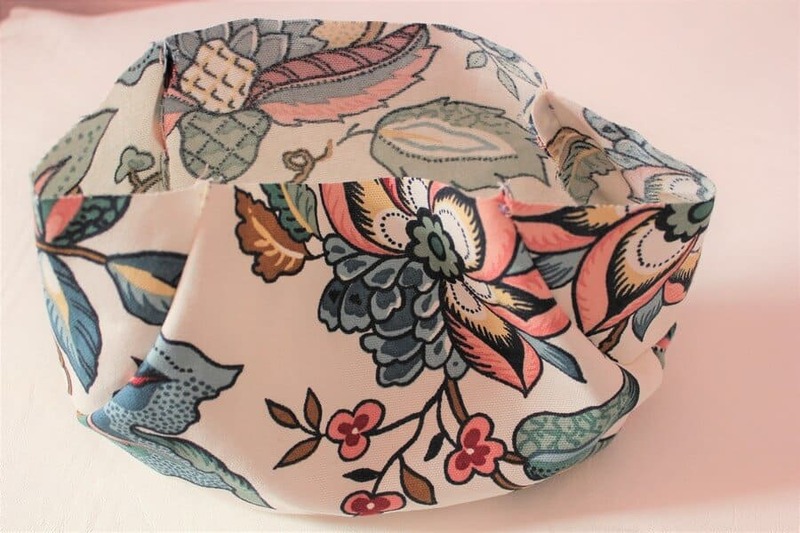 Make piping, attach it to the side pieces and stitch sides of the purse. Piping is a nice detail for the sides of the purse. I used pink leather for piping. Brush the glue mixture on the leather strips. Place the cording on the leather strip (in the center) and fold the leather over the cording. Make sure that you put together lengthwise edges of the leather strip. Seal edges as close to the cording as possible. Now you have 1 cm (⅜ in) seams in your piping from where you joined your strips. Cut these seams 0.7 cm (¼ in) from the edge so you can curve your piping. Place piping around the side pieces of the purse, glue it ( only at the edges, try not to glue the piping itself) and stitch with a machine over seam allowances. Here I had to change the needle from size 90 to size 100 because I got already many layers to stitch. 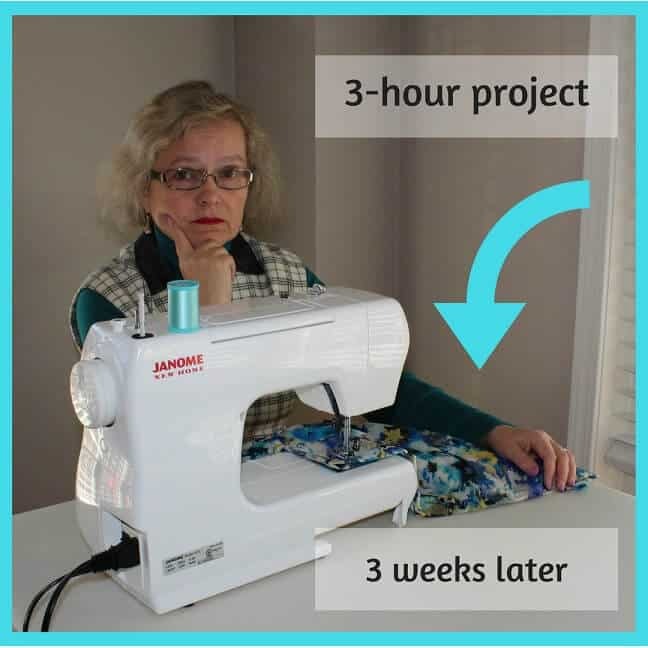 Change the sewing machine foot to zipper foot, attach the sides with piping to the purse (using clips) and stitch close to piping. I guess half of the sewing the purse is done now. Here I stop with this post and will continue the tutorial in part 2. By now I guess you see that you don’t need any special training and equipment to sew leather. Do you have any questions? If you prefer the video tutorial (with sound) check out my YouTube channel here. If you found this tutorial helpful or know someone that WILL find it helpful, I’d greatly appreciate you sharing it on Pinterest, Facebook, Google+ or Twitter. And of course, leave a comment below letting me know about your struggles or your successes with making the leather purse. 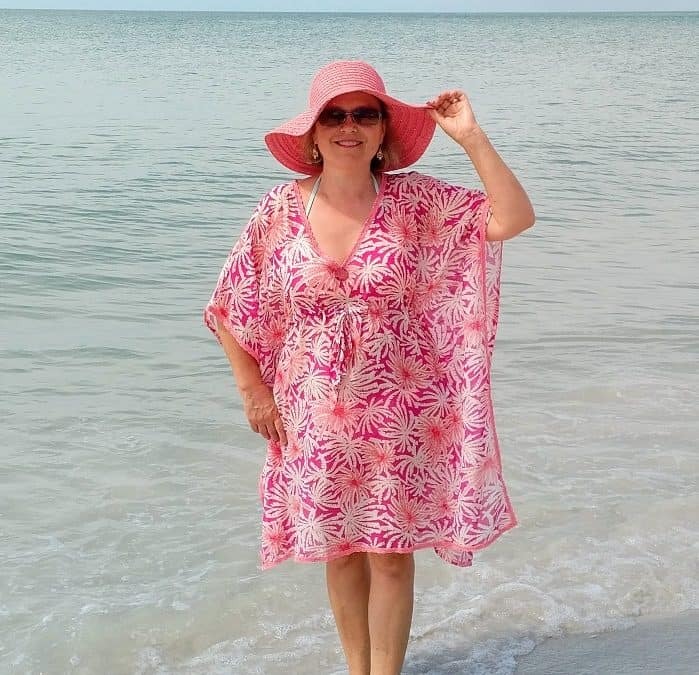 For those of you who are interested in starting your own sewing blog and curious about what WordPress theme I use on my blog there is a banner below with a link to Divi theme. Thank you, Wanda! I would really love to see your bag when you finish it. And feel free to contact me if you have any questions. Thank you for your kind words! I am happy to hear you are going to make a leather purse using my tutorial. Don’t miss part 2 (coming soon) where I will show how I made leather flowers and attached the metal frame. Wow, Your tutorial is really awesome. I read your blog and i get the many ideas for make a leather purse. Make leather purse is creative work. The pdf download only has pattern #3 on it. Where do I find #1 and #2? This is the perfect guide to make a leather purse and I am first time visit on your blog and I really like it and thanks for the amazing article. I watched the videos, you have done a wonderful job. I am gonna make a leather purse by following your tutorial. thanks for sharing such amazing video tutorials and please keep it up.